short story writer, novelist, poet, playwright. Born 18th May 1950 in Prilep. Editor-in-chief of the literary journal “Stremez”. 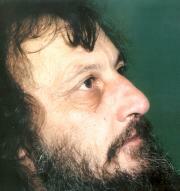 Member of the Macedonian Writers’ Association since 1980. Works: A sketch for a Gobelin tapestry with a clown (drama, 1971). Empty – handed harlequin (novel, 1981) First degree murder (drama, 1983), Hanging a dog (short stories, 1983), Fair Mitra (novel, 1984), Liberated man (novel, 1986), Light beyond the hill (novel, 1990), Hunting (novel, 1991), Building of a church (drama, 1993), Siljan Flies again (novel, 1994), The hidden of the Speech (poetry, 1997), Phantasmagorias (short stories, 1999), Mushrooms (a book on mushrooms, 1999), Jonah and the snail (novel, 2000). Address: Lazo Filiposki, 16, 7500 Prilep.